The RSGB run a series of contest aimed at getting clubs active as a team. 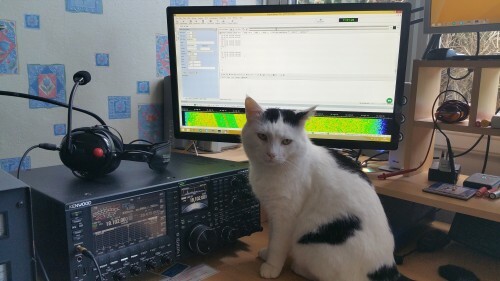 This year Havering ARC had 2 active stations, one operated by Fred G3SVK and the other by Dave M0TAZ. The contest encourages teamwork, and members can operate from home. The combined score from the team contributes to the club score over the course of the year. Fred G3SVK reports that in between other activities he completed 156 contacts. His aerial was best placed for 7 MHz, so Fred didn’t venture onto 3.5MHz. I set myself a target of 200 contacts, and had reached that after 3 Hrs. I did a little bit of operating on 3.5MHz, but the vast majority was on 7 MHz. Using a doubt antenna and 400w, the only distraction was from Billy who decided he wanted part of the action.